Club Penguin Cheats by Mimo777 Club Penguin Cheats by Mimo777: Club Penguin October Parent Update! 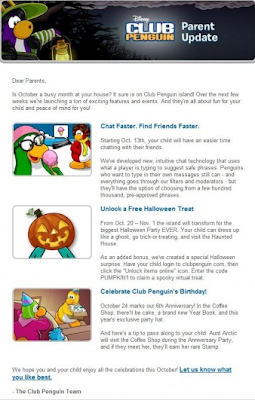 Kinda phunnie we are just now getting this and it talks about the new chat "Starting October..."
And, we get to see Aunt Arctic soon! Woot! hey mimo if the code is PUMPKIN1 dont you think there will be a PUMPKIN2?i hope thats what they mean. went on cp just a few minutes ago. the halloween party should have started but then Rockhopper was there (his ship) and i clicked to go on it and it said connection lost lol glitch?? There's a new stamp for Halloween! It's called 'Trick-or-Treat' and in achieve it you have to visit 10 trick-or-treat igloos (the one with 3 different houses in it) during the Halloween party. BUG! When you are a non-mem and you try to enter the dark chamber it says OOPS! You are not allowed to enter the Great Puffle Circus (or something like that). Instead of Dark Chamber. The same thing happened to me, execpt the ship wasn't there I couldn't go to the Dark Chamber or Haunted House. Not even the entrance so I couldn't even do the scavenger hunt!